Defiance Games Marines almost ready to go! 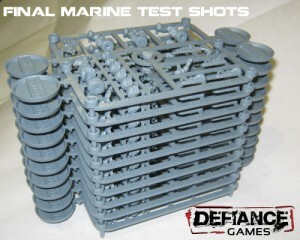 Defiance Games has the nearly-final sprues for their marines ready to go. Oohrah! We're VERY excited and relieved to have received the following pictures from the toolmaker today. The 3rd round of mold tweaks and test shots has gone extremely well and the USMC mold is 99.9% ready to go. There are two last bit tweaks needed, but as you can see - the Marines are about to hit the beaches!